Skill 1. Learning (Investigative thinking). Learning, including collective intelligence and evidence-based research (investigative thinking) is the foundational skill for serious foresight. Some practitioners consider learning to be as fundamental as the Three P’s strategic foresight skills (anticipation, innovation, and strategy). We think that the Three Ps is still our best general model of core foresight, and that learning is best understood as the critical preparation we need in initiating good foresight process. Running the entire Do loop is of course also key to successful foresight. Many firms don’t have a name or formal department (Research, Intelligence, L&D, Metrics) for most of their learning/investigation skills. But all successful firms have people who are talented at the learning skill. Ideally, adaptive firms have individuals explicitly tasked with learning-related functions. Those that don’t start decisionmaking with this skill will quickly end up being surprised and outpaced by the future, rather than continually learning how to take best advantage of change. In alpha order, the first specialty we will talk about in the learning skill is Accounting & Intangibles. The better you, your team, and your firm can measure the key processes that matter in your internal and external environment, the better you can grasp your current conditions, which are the foundation of foresight. The firm’s key performance indicators flow from its strategic objectives, but determining what to measure and how to best measure what we want is a constant learning process. Ben Waber’s People Analytics, 2013 is a good introduction to evidence-based HR practices. Jack Stack’s The Great Game of Business (2013) is a great intro to open-book management, which is built on metrics-based goals and team performance rewards. Bob Eccle’s One Report (2010), introduces simplified sustainability metrics and reporting. Doug Hubbard’s How to Measure Anything (2014) is a great guide to measuring intangibles that your team and your models indicate are important to your work. Many of the processes, opportunities, and problems around us aren’t presently being seen or measured, and doing continual surveys, polls, focus groups, and other methods of feedback (reviewing) is a key way to close our Do loop, and give us useful information that we can then learn more about, investigating causes, histories, and relationships. Good future-thinkers are always measuring things, and learning trends, data and facts that either signal to them that they are on track, or that it is high time for a change. For a few examples of the latter, see Jessica William’s 50 Facts that Should Change the World (2007), and Stephen Fender’s 50 Facts that Should Change the USA (2008). Consider the following disturbing fact from a 2013 Lancet series on Maternal and Child Nutrition: Roughly 3 million children (5 years and younger) die a year, one every ten seconds, 8,000 a day, as a result of lack of adequate food for the mother or child, via diseases induced by undernutrition or via outright starvation. Half of these deaths occur in one planetary location of greatest need: Sub-Saharan Africa. Globally, undernutrition accounts for 45% of child deaths, and 165 million children are today stunted and immunocompromised because of lack of sufficient nutrition during their childhood. How soon will it be before some social entrepreneur or human development NGO develops an Internet & Facebook of Maternal and Child Nutrition, a platform for finding and monitoring the most at-risk moms and kids globally, and connecting them to the 440 million sponsor families in the thirty-four OECD nations and other parts of the more industrialized world? If we can instrument and visualize our gadgets, we can do the same for our adopted at-risk families in Mali, Chad, or Pakistan. The platform could be evidence-based in its recommendations of support, maximizing quality-adjusted life years for the at-risk family by focusing first on maternal and child nutrition, sanitation, security, maternal, paternal and child education, reproductive choice counseling, and a whole host of other issues. Video snips of that family and their sensors would be uploaded daily to the web, to record any violence or corruption or misfortune happening to them. From 2011 to 2014 Malaysia gave out 1.5 million netbooks to their children and established thousands of village wi-fi hubs in their National Broadband Initiative. There’s no reason we can’t find and connect up the most at-risk families globally directly to OECD sponsor families, one family at a time. Plenty of us would love to have such a direct way of helping others. How many? That remains to be seen by some social entrepreneur and their courageous funders. 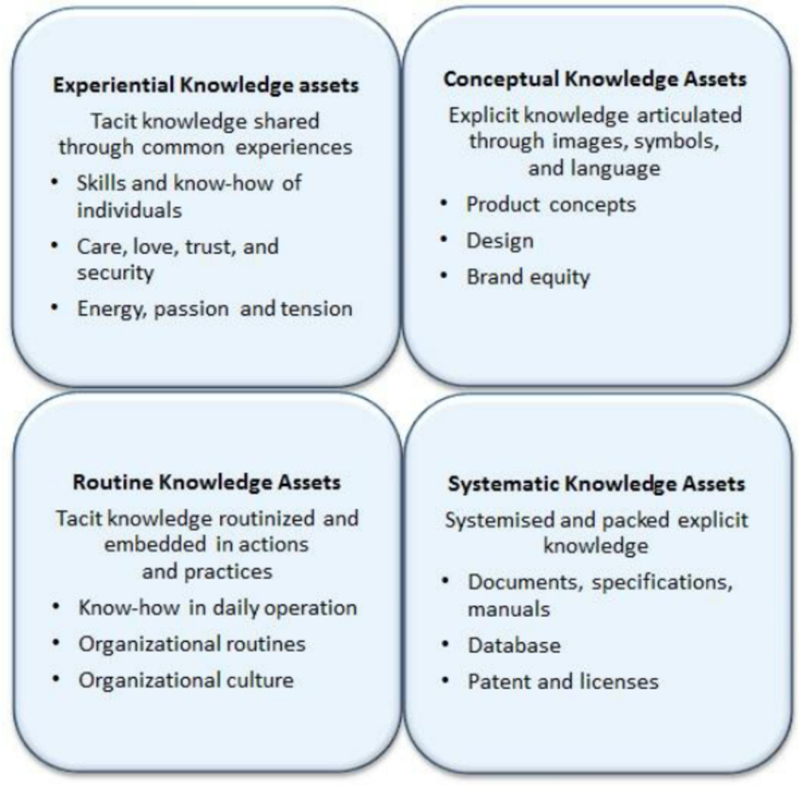 Intelligence & Knowledge Management, which includes scanning and research, is the oldest term of art for how organizations learn about the environment. Strictly speaking, intelligence is about better understanding the relevant past (hindsight) and present (insight), both preconditions to superior anticipation, innovation, and strategy. This function is what a typical foresight practitioner starts with when researching a client’s problem, or doing general scanning (“continuing education”) for useful novelty. Focusing more narrowly on sociopolitical and defense futures, the new foresight field of intelligence studies has developed a number of useful methods and a graduate training community that serves many client types (politics, defense, law enforcement, business, NGOs). The field of business intelligence uses business and organizational data to learn about and benchmark organizational performance and processes, and generates methods, tools and platforms to improve organizational awareness and performance. Another powerful learning and anticipation tool is group polling, or the gauging of group opinion whenever the organization is faced with abstract, complex, or unstructured problems. Surveys, focus groups, and other group interactions are a classic form of collective intelligence. 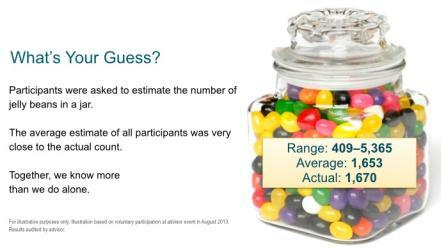 James Surowiecki, in The Wisdom of Crowds (2005), introduces this idea with the Jelly Bean Estimation Challenge (how many jelly beans are in this jar?) to remind us of value of group intelligence. In a result that has been replicated many times over the last two centuries, polling a cognitively diverse crowd and averaging their guesses on this task will greatly improve estimation accuracy over individual guesses (see picture below for one recent example). As Don McDonald notes at Vestory.com, markets work the same way—in theory, integrating group knowledge into stock prices in a way that is presumably more accurate than individual investor guesses. That’s why it’s hard for individual investors and fund managers to consistently beat the market. They need both superior intelligence (as long as it’s legally obtained) and faster decision-making ability (OODA loop) to beat group learning and discern a more accurate future price. This is the theory behind prediction markets, which are an anticipation tool (Skill 3) as they are about the future, not the present. According to Henry Jenkins, group intelligence where participants make mostly independent decisions, as in prediction markets, can best be called Wisdom of Crowds. Group intelligence tasks where lots of interaction occurs within the organizational or social group, like knowledge management, and forecasting methods like Delphi, can best be called collective intelligence. See MIT’s Center for Collective Intelligence for more resources on that emerging topic. Most leaders know about competitive intelligence (see SCIP.org for a professional association), but they often underuse it. They also often underestimate the power and usefulness of collective intelligence, and why the crowd, under the right rules and connectivity, consistently beats experts in such skills as learning, sensemaking, and prediction. Leaders may also know about environmental scanning, an intelligence function where investigators monitor events that may signal ongoing or upcoming change, catalog and evaluate this info, and distribute it to others. But many are unaware of other intelligence specialties, such as technical intelligence, which can be used to determine if a proposed technology investment will be smart or a big waste of money, or any of the other intelligence gathering disciplines, all of which can be applied to firms. George and Bruce’s Analyzing Intelligence, 2008, is a good intro to the breath of modern intelligence work. Seena Sharp’s Competitive Intelligence Advantage, 2009, is a good intro to competitive intelligence. Knowledge management is another basic intelligence function. In addition to SCIP, there are a variety of professional associations (KMA, KMPro, IKMS, KMBA, KIPA) focused on advancing the collection and sharing of organizational knowledge. KM pioneer Ikujiro Nonaka, professor at my business school, the Haas School at UC Berkeley, has a valuable four-category model for different types of organizational knowledge that a good KM system should try to cultivate, preserve, and improve. A third key learning specialty is Learning and Development, a term that can include both employee learning and organizational learning and development (including research). As Eric Hoffer says, in a world of constant change, the learners inherit the future. Being a lifelong learner, taking regular training courses, and gaining new credentials every 5-10 years is a great step in being adaptive. As MOOCs, wikis, computer adaptive testing, neuroscience-based training and other learning platforms move onto the web, our job skills can get better and more “just-in-time learned” every year. Online educational platforms like Udacity, Coursera, and 2U, video learning companies like Lynda, and global online tutoring like TutorVista, which offers 24/7 tutoring from India, in any subject, at a disruptive price ($12-20/hr), are beginning to really lower the cost of individual and employee learning. Peter Brown et al. have written a great new book on the cognitive science of successful learning, Make it Stick (2014). If you’d like to know more about the future of educational tech and how it will increasingly decrease, track and improve the ROI of all learning, EdSurge has a great free newsletter. Peter Senge’s The Fifth Discipline: The Art and Practice of the Learning Organization (1999/2005) proposed that becoming a learning organization is the best way to stay competitive in a complex, accelerating economy. He also proposed that systems thinking is the foundational, or “fifth discipline” that integrates four other key organizational learning disciplines: mental models, personal mastery, team learning, and shared vision. Smith (2001), interpreting Senge (1999). Mark K. Smith offers a helpful graphic organizing Senge’s five disciplines into a developmental hierarchy (picture right). At the base of organizational learning we can place systems thinking. Systems thinking occurs when an organizational member seeks to identify relevant actors, relationships, and constraints. Next, we use our systems experience to find or build mental models, methods, and practice frameworks (Chapters 4 and 6) for our personal and organizational environments. 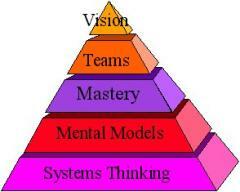 Then we use these models, methods, and frameworks to seek individual mastery in various specialties. At the same time, the organization’s employees and stakeholders, interact with their individual mental models and masteries to do teamwork. Finally, with good leadership and facilitation, team learning and foresight leads us to shared vision. Consultants and leaders benefit greatly when they learn to become systems thinkers, as there can be great strategic value in having a good map of relevant actors, relationships, and constraints. Good starter books for systems thinking are Ackoff and Addison’s masterful Systems Thinking for Curious Managers, 2010, Eliyahu Goldratt’s The Goal, 2012 and Theory of Constraints, 1999, and for some, Donella Meadow’s Thinking in Systems, 2008. We don’t share Senge’s premise that learning is the central skill of successful firms, but propose it instead as the first of eight key skills. Executing adaptive strategy, a mix of Skill 4 and Skill 5, is our proposal for the central two skills of the Do loop. Spend too much time or money learning, training, or making models and your firm will quickly be overtaken in a competitive environment. Learning activities are always in a delicate tradeoff with the other seven skills. Senge’s model is appealing to learning-oriented managers, but it and other organizational learning models are not yet deeply evidence-based, as Senge’s critics have pointed out. One of the top learning priorities for any firm should be evidence-based management, which seeks to find the best evidence available to guide current policies and processes. 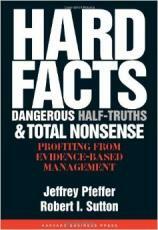 See Pfeffer and Sutton’s Hard Facts, Dangerous Half-Truths, and Total Nonsense (2006) for examples of how this works in practice. Can your team provide hard evidence for the policies they are using? Do they research the evidence for the critical policies? Or are they instead used based on your leader’s force of personality, opinion, tradition or other weakly-grounded alternatives? If so, your firm’s foundation is sand, and the storm may be coming tomorrow. We should also recognize that in an environment of accelerating change, the faster competitive events occur, the less value there may be in long-term planning, and the more in just-in-time learning and just-in-time production and execution (learning, strategy, and execution). In fast-changing environments we may need only enough learning, anticipation and contingency planning to capitalize on opportunities and avoid dangers a bit faster than the competition. It is a certainty that anyone who tries to see, plan and execute too far ahead, both in their personal life and in their organizations, will quickly find out how much time and energy they’ve just wasted, and how poor their plans quickly become relative to reality. It is often better to learn from small batches of work, continually improved with customer feedback, than to invest in large batches, which require long-term strategy, and which commit us to big bets in search of economies of scale. Sometimes first movers gain great competitive advantage, but more often, being a fast follower, letting others do the costly experiments and jumping in quickly to copy or acquire them if they start winning can be a much better strategy. See George’s Fast Innovation (2005), and Doz and Kosonen’s Fast Strategy (2008), and Kotter’s Accelerate (2014) more on the subtleties of these topics. In a lifetime of diligent learning you will encounter many of your own enlightening or disturbing facts. Some of these will greatly help you make a case for change in yourself, your company, your industry and your world. What you do with those facts, whether you cycle them into your personal or organizational Do loop, at least to share them with others, is up to you. Amazon is a classic example of a first mover, whereas Google has been a fast follower: be the first, or be better!